Some of the worst wildfires in California’s history occurred in 2017, with 500,000 acres in the state burning this past fall. The Thomas fire burned over 281,000 acres in Southern California’s Ventura and Santa Barbara counties starting Dec. 4, and was just contained on Jan. 12. The danger did not end with the wildfires. Flash floods struck Southern California on Jan. 9, with almost one inch of rain falling within 15 minutes. This led to sudden mudslides in Southern California. These mudslides devastated the coastal town of Montecito, while many residents were just returning to their homes after evacuating due to the wildfires. As of Jan. 21, 21 people have died due to the mudslides, 2 are still missing, dozens of people have been injured, and hundreds of homes damaged. Roads in the area have been damaged and blocked as well. Authorities hope to return residents back to the area by January 31. The disaster, while tragic, is somewhat common in California. A subtype of landslide, a mudslide is the movement of a large mass of rocks, soil, mud, and organic debris down a slope. Mudslides often follow natural disasters, like volcanic eruptions, earthquakes, and floods, and occur throughout the United States. Their speeds vary, with some taking months at a time and others moving dangerously quickly. Mudslides can push large, dangerous debris—like boulders and cars—at speeds of up to 35 miles per hour, and they can start with just one-third of an inch of rain. After a fire, mudslides are particularly hazardous, since they can occur with little to no warning—as was the case in California. The heavy rains following the wildfires, along with the fires themselves, caused the extreme mudslides. 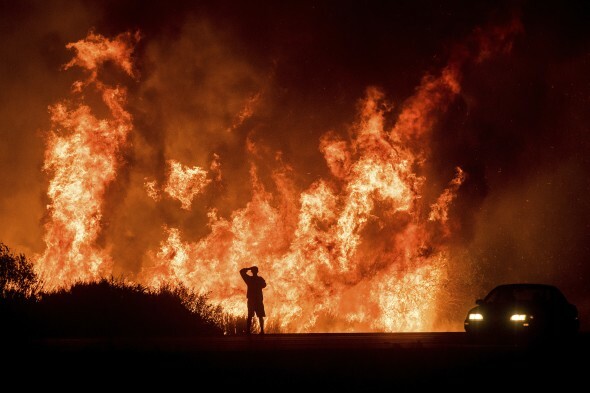 The fires, fueled by higher-than-average temperatures, drought, and the Santa Ana winds, burned away the vegetation that held soil in place and absorbed water. Without the vegetation, the slopes near Montecito were destabilized, making material more prone to sliding down due to gravity and floods. Additionally, multiple mudslides can still happen in the same area. Many parts of California will remain vulnerable to mudslides even decades after they occur, especially if the coming rainy season brings more flash flooding. Whether a projected increase in California’s wildfires would increase the likelihood of landslides and mudslides in the area can’t be said for certain, but this recent evidence implies so. Worsening droughts and wildfires would increase the environment conducive to mudslides, and factors like climate change raise the chance that these devastating phenomena could become even more severe in California’s near future.